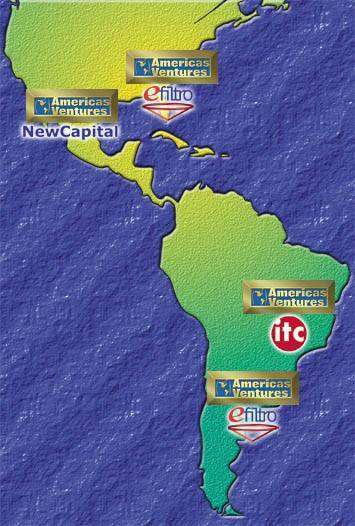 Americas Ventures is a consortium of high integrity, experienced, and professional venture capital consulting firms for North and South America. Finding that there is indeed strength in joining forces, Americas Ventures firms can provide pan-regional coverage for any business development or capital funding project. We have worked together since 2000 for various customers, and decided to formally join forces in November of 2001. As individual firms, we provide venture consulting, capital funding and business development services in our regions. As a group, we are able to cross borders in order to raise capital with the largest global firms, and especially, to develop projects pan-regionally. For North American firms desiring expansion into Latin America, we provide a comprehensive market research, target customer lists, strategic plans, assistance in establishing operations, public relations, and even customer representation. While it can take months or years to understand the complexity of Latin American business and culture, Americas Ventures teams can enact in a short time period. Likewise, for our Latin American customers seeking to enter the United States markets, we can show the way through the greatly competitive arena and create tangible sales results in a fraction of the time it would take a customer by themselves.